How can your organisation attract, retain and motivate millennials? With graduations now behind us, UK businesses are seeing a new tranche of young people enter the workforce. Looking at the bigger picture, with technology enabling organisations to be more agile, flexible and innovative in the way we do business, it’s an exciting time to be thinking about how businesses can attract and retain the best from the UK talent pool. Taking the first step of looking at how the business runs and how employees can be best supported, has huge potential to maximise employee productivity. This is especially important when considering the latest ONS figures which revealed a decrease in output-per-worker in the UK. Improving employee productivity, of course, relies upon businesses having the right working practices, culture and technology in place to unlock human potential – within their current team as well as those they’re trying to attract. Ultimately, this is what will help boost the economy. So what then do prospective employers need to do to attract and accommodate the best and brightest ‘Gen Z’ talent? As these digital natives were born into a world rapidly being transformed by technology, Gen Z bring with them unique expectations of how they want to work. Business leaders and those responsible for how an organisation operates day-to-day should be working together to establish how they can meet the needs and expectations of this generation in order to increase productivity and overall performance. Despite technology being a priority, Gen Z care even more about the team around them with almost three-quarters (74 percent) stating their team as the factor contributing most to their productivity, compared to Baby-boomers (60 percent) who value flexible working policies more with 72 percent. The results revealed 61 percent of respondents agree that the quality of devices available makes them more productive, compared with a UK average of 55 percent. With almost two thirds (63 percent) saying training contributes to their daily productivity – compared with an average of 56 percent among the wider workforce- the level of training provided is a key contributor to success. It’s clear Gen Z doesn’t feel it necessary to be in the office all of the time. Although lower than the UK average, for those with flexible working policies in place, over half (56 percent) still point towards flexible working as a contributor to productivity. Workplace culture helps to create exceptional, high performing workers, with over half (55 percent) highlighting the impact that workplace culture has on personal productivity. Knowing where and how to direct your investment in supporting Gen Z will make all the difference in how well your company attracts and retains the best talent. With the average person spending a staggering 90,000 hours at work over a lifetime, it’s perhaps no surprise that Gen Z list the team around them as the number one motivator for keeping productive in the workplace. Given the importance of information sharing in today’s workplace, organisations should be assessing whether they have the right technology in place to guarantee their teams feel connected to one other, even if they’re not physically in the same working location. As we continue to hurtle into a digital landscape, the quality of technology and devices will ensure the younger generation is properly equipped to work at their best. Because the quality of technology matters to Gen Z, businesses could conduct a technology inventory of their business as it stands – working out what technology they have and where changes can be made to better suit employee needs and expectations. Having the opportunity to brush up on their skills and expertise, ensuring these remain relevant in a changing environment, is clearly key to Gen Z, with over three-fifths (63%) stating a sufficient level of training is needed to keep them productive. To maintain regular training while embracing flexible ways of working, Gen Z employers can ensure training materials are available online, not to mention accessible 24/7. The findings confirm that making an effort to cater for the needs of the new generation of candidates entering the workforce will be key in boosting a business’ overall productivity. Our London School of Economics ‘Power of Productivity’ report found that an organisation can unlock productivity by looking at three key levers: management practices; the use of technology; and workforce flexibility. This very much mirrors what we heard from our Gen Z respondents. 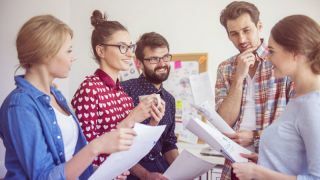 By focusing on these three areas, businesses can enable their new Gen Z employees to be agile, happy and productive at work, now and in the future. It is technology that will form the foundation to a functional and collaborative multi-generational workforce. With four generations in the workplace today, organisations are no longer able to rely on a one-size-fits-all model to support such a diverse workforce. With these steps, businesses can now look at how better to attract, retain and get the most out of this fresh pool of talent.